Published: June 13, 2013 at 04:26 p.m. Updated: June 13, 2013 at 05:12 p.m.
Are you ready to buy in on the Dallas Cowboys this season? We understand if you aren't. After all, the Cowboys have turned mediocrity into an art form in recent years. 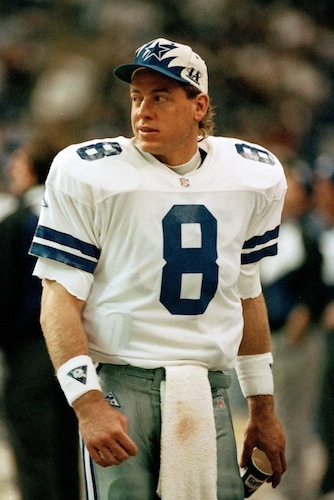 Call them America's Team if you wish, but the Cowboys have exactly one playoff win since the days of Troy Aikman and those really grim Logo Athletic hats. Yes, Big D has represented Big Disappointment. Still, Cowboys executive vice president Stephen Jones has high hopes for the franchise in 2013. "We really feel like we have a team that can compete for a championship," Jones said Thursday, according to ESPNDallas.com. Jones pointed to parity as a reason for his optimism. "The last three teams that won championships barely got into the playoffs and did something about it," Jones said. "You're probably not being realistic if you don't think things have changed in the last 10 years. "There's probably a lot of people who feel they have a chance to win a championship based on the level playing field and how the cap has affected the game. We feel like we have an opportunity to compete for a championship." Jones isn't talking nonsense here, and the Cowboys certainly have the talent to make the playoffs and get hot in January. It's not impossible. That said, the Cowboys in the Romo era have failed in enough big spots to earn rolling suspicion. They're in prove-it mode until they slay some ghosts.